Why Do Decks Need To Be Maintained? Wood weathers and decomposes due to many elements. The two main elements that cause damage to exterior wood are moisture (caused from rain, dew, etc.) and ultraviolet rays from the sun. Other common factors are traffic, location and temperature. All these factors contribute to the degradation of the wood’s lignin, which is a glue-like substance that holds wood together. When lignin begins to break down it will cause splitting, checking, raised grain and, most obvious, discoloration of wood. Mildew growth along with the cellulose left as the lignin degrades leads to a surface that is gray in color. 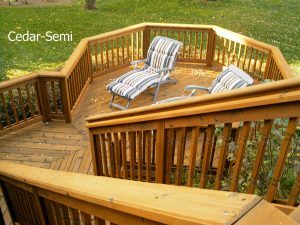 Loose fibers on the surface need to be removed before the deck is stained, otherwise the hard work of staining the deck will simply seal in the discolored and weathered-looking wood. The vast array of stains and sealers on the market today fall into three different categories: Solid, semi-transparent and transparent. 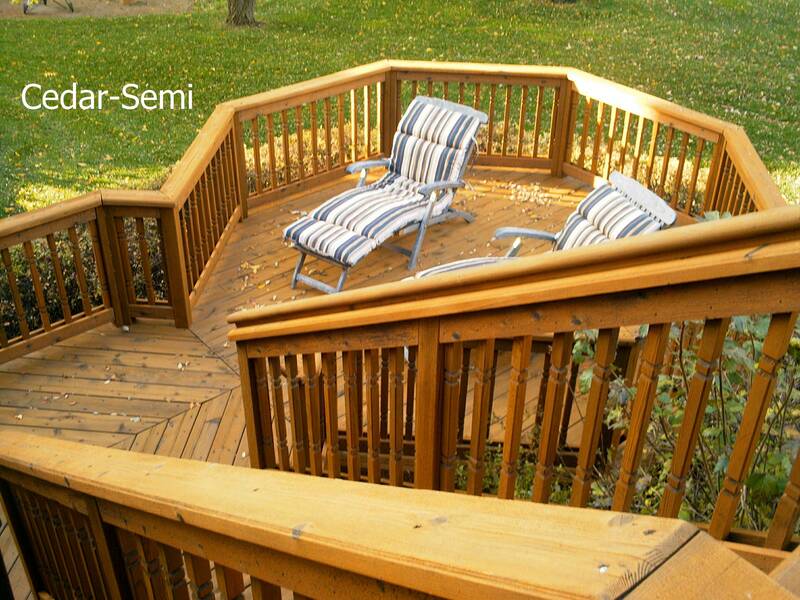 Solid stains are film-forming stains that actually lay on top of the wood. Solid stains, like all stains and sealers, will breakdown over time. Beyond fading, the effects of the sun along with excess moisture will cause solid stains to peel and chip. We believe the best way to protect exterior wood is through the use of non film-forming oil based stains. These are labeled as transparent and semi-transparent stains. Stains in these categories are penetrating, and do not form a film that sits on top of the wood’s surface. Penetrating transparent and semi-transparent stains contain pigments and oils that do not form a surface. Our recommended stain is Armstrong. Armstrong’s formula is a combination of drying and non-drying oils that gives the user two layers of protection. Armstrong’s Wood Stains have non-drying conditioning oils that separate from the drying side of the formula. These oils penetrate deep into the wood fiber where the wood’s natural oils used to be. This process rejuvenates the wood. The drying oils stay at the surface, lock in the conditioning oils, and create a barrier that is dry to the touch. Armstrong can be applied in direct sunlight. Applications are for all new, old, pressure treated and cedar wood surfaces such as: Decks, siding, shakes and shingles, fences and log homes where color retention, water repellency and wood conditioning is the desired goal. What Is A Wood Brightener? All wood surfaces should have a neutral pH balance before any stain is applied. Using wood cleaners and strippers will alter the pH, and require the use of a brightener to restore the wood to its neutral state. By applying a wood brightener, a neutral environment is created on the wood surface. This helps to open up the wood pores and lighten the wood. The result is a “brand new wood” look that is always desired. The longevity of the stain is directly proportional to the surface preparation. Achieving a neutral surface through the use of a wood brightener will ensure the best results for the staining process. Using a wood brightener is always recommended anytime a cleaning or stripping agent is used. We are pleased to offer our deck clean and stain services in the areas of Fenton, Linden, Grand Blanc, Hartland, Brighton, & Swartz Creek.